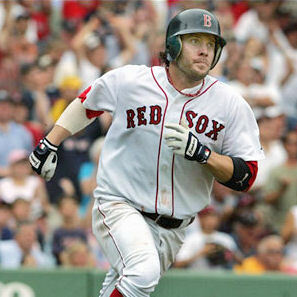 ON THIS DATE (September 21, 2004) ... Curt Schilling was more than up to his task. The fact that he got a no-decision, instead of his richly deserved 21st win, is of consequence perhaps only to those who think 21 wins is a lot more than 20. It wasn't his fault, that's for sure. He was magnificent. The Red Sox escaped from Fenway Park with a dramatic 3-2, ninth inning victory tonight in a game that had one dominating theme for eight innings, brilliant pitching by Schilling and Rodrigo Lopez, and more than a few plot twists in a bizarre ninth. The Sox had it, gave it away, and then got it back on a two-out, two-run single by Mark Bellhorn off Orioles closer Jorge Julio. 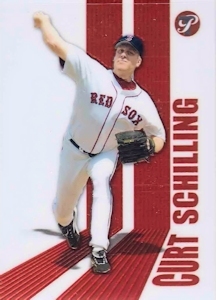 Schilling, who was a beast. Over eight innings, he yielded three singles. He struck out 14, the first Sox pitcher to record that many K's in a game since Pedro Martinez fanned 14 against Toronto July 1, 2002. He threw 114 pitches, 90 for strikes, and left the game pounding his glove after whiffing the last three batters in the eighth inning. At the time, the score was 0-0, because Baltimore starter Lopez was matching Schilling, inning for inning, goose egg for goose egg. In the eighth, the Sox loaded the bases with one out, and pinch hitter Kevin Millar, in a great at-bat against nasty lefthander reliever, B.J. Ryan, delivered a sacrifice fly to right. That made it 1-0 for the Sox and that should have been it. Francona called for Keith Foulke to close it in the ninth. Foulke had converted 16 straight saves, so it seemed like a wise decision. But Foulke couldn't finish the deal, depriving Schilling of a 21st win and nearly costing the Sox the game. Javy Lopez jumped on a 3-and-2 changeup with two outs and sent it into the eastbound lane of the Mass. Pike. The homer, the second in as many nights off Foulke, scored Miguel Tejada, who had singled, and the Orioles had a 2-1 lead. Fenway went from raucous to silent in a heartbeat. When the Sox came to bat in the ninth, Orioles manager Lee Mazzilli elected to stick with Ryan. But Ryan created a mess by walking pinch hitter Kevin Youkilis and then yielding a Wall double to Bill Mueller, who had four hits in the game. Ryan bore down and got pinch hitter David McCarty on a popup to first and then struck out Johnny Damon. Mark Bellhorn, who already had two strikeouts, was next. Mazzilli went to Jorge Julio. Bellhorn worked the count to 2-and-0, took a strike, and then drilled a shot to right-center that eluded Larry Bigbie and the Red Sox bench erupted, pouring onto the field, releasing three-plus days of pent-up emotion and adrenaline. The two runners scored easily. And, for one night at least, things seemed normal on Yawkey Way, even if everything had come about in a most abnormal fashion.